Minnesota goaltender Devan Dubnyk made 25 saves and Jason Zucker scored a hat trick as the visiting Wild cooled off Tampa Bay in a 3-0 win on Thursday, breaking the Lightning's eight-game home winning streak. Dubnyk recorded his second shutout this season and the 31st of his career and improved to 6-0-1 in his last seven starts for the Wild, who swept the two-game season series from the Lightning. Zucker recorded the hat trick when he tallied his 20th of the season into an empty net with 1:46 left in regulation, giving him eight points in his past seven games. Eric Staal's assist pushed his season-high point streak to eight games. Ryan Donato notched a pair of assists for Minnesota, which is 6-0-2 in its past eight games. 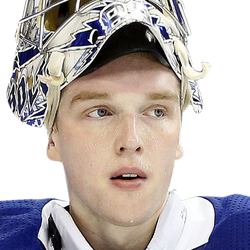 The Lightning's Andrei Vasilevskiy stopped 27 shots and saw his 10-game winning streak come to an end. Vasilevskiy kept the game scoreless early when he stuffed Joel Eriksson Ek on a breakaway 2:10 into the game, but Zucker put the Wild on the board later in the opening period. Zucker dropped a pass to Donato, who fired in a shot past Lightning defenseman Dan Girardi. Zucker continued going to the net and tipped the puck by the Russian goalie at 10:50. Wild center Luke Kunin, wobbly and struggling to get off the ice, left the game in the second period and went to the dressing room after a hard hit from Cedric Paquette. Kunin he did not return. Both goalies made highlight-reel saves with less than three minutes left in the middle period to keep the score at 1-0. Minnesota's Kevin Fiala patiently waited out a sliding defenseman on a three-on-one, but Vasilevskiy denied him as he moved in, and the puck careened halfway up the ice in the neutral zone. Tampa Bay's Anthony Cirelli collected it at full speed and broke in on Dubnyk, but the 6-foot-6 netminder dived and deflected the attempt out of play. Donato blasted a shot that Vasilevskiy deflected straight up in the third period, and Zucker batted in the puck at 6:04. Donato has nine points in his first eight games since being traded to Minnesota by Boston on Feb. 20, including points in his first five contests with the Western Conference club. He had nine points in 34 games for the Bruins before the trade.